Perfect for non-eyeglass wearers, these safe solar wrap-around viewers are perfect for daytime viewing of the sun and searching for sunspots. Features extra wide temples and shield above the nose bridge eliminating most ambient light leaks and putting you in a truly dark viewing environment. Constructed from scratch resistant black polymer, each lens boasts an optical density of 5 or greater. 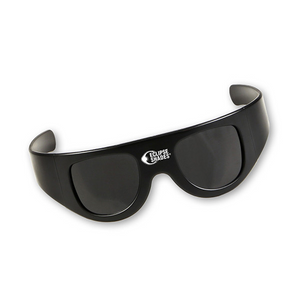 They provide the ultimate in protection from harmful solar radiation filtering out 100% of harmful ultra-violet, 100% of harmful infrared, and 99.999% of intense visible light. Viewers enjoy a sharp, orange-hued image. Ages 8 and up; adult supervision recommended. 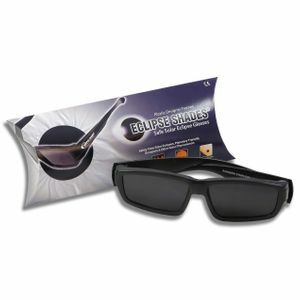 Safe Solar Eclipse Glasses are Certified and ABSOLUTELY SAFE FOR DIRECT SOLAR VIEWING. 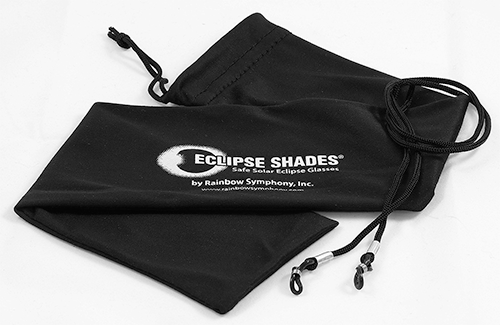 Includes a glasses lanyard and a micro fiber pouch for storing and cleaning your Eclipse Shades®. Note: due to the wrap around feature, these glasses do not fold for compact storage.